Welcome to the 2nd Headliner Highlight, a series where we talk with the people behind the podcast in order to learn how they create, share, and think about podcasting. This week, we talk with Mary Baird-Wilcock the host of The Simplifiers Podcast. What is The Simplifiers Podcast about? We take topics in business and in life… and SIMPLIFY them! Our listeners currently tuning in from 75 countries around the world are primarily female small business owners, founders, freelancers and solopreneurs in creative industries, especially wedding/event planners, photographers, other coaches, marketers and more. How long have you been podcasting? What do you do to share & promote your episodes? In everything we do, we treat this podcast as a business, releasing episodes consistently every Tuesday and Friday with military precision. What has been most effective? Least effective? We also make Headliner videos to promote our long form Tuesday interviews on InstaStories, typically breaking it up in to 4x :15 mini videos to create a 4-part story on Instagram. In addition, we create a Headliner video, complete with the soundwave effect for our friday bonus episodes and publish this to @TheSimplifiers YouTube channel. That way, we are diversifying how and where people can consume our podcast content… not just on all the podcast players, but on YouTube as well. 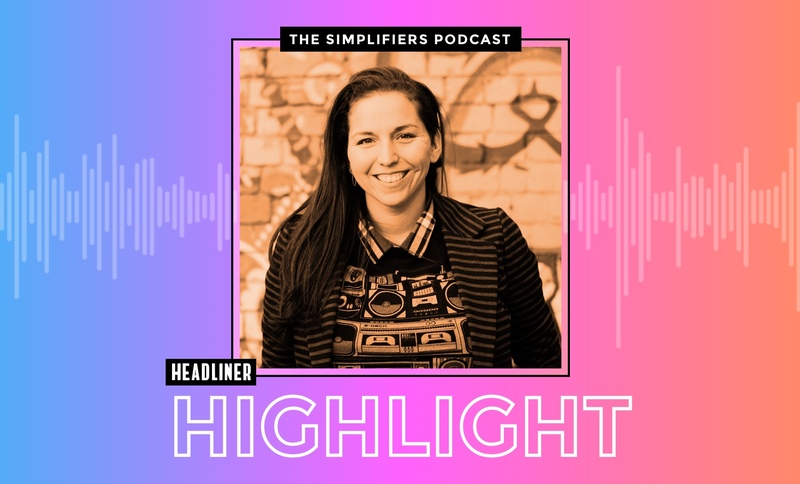 We are finding that putting these Headliner videos on IG and Instastories, plus our longer Headliner videos on YouTube are super effective for catching people’s eyes and peaking their interest to click through and listen to the full episode. Why do you make audiograms? They are dynamic, visually appealing to the eye and super simple to create within the Headliner app. My Show Notes Editor creates these currently for our podcast and she’s found the platform to be super intuitive to create dynamic videos, fairly quickly each and every week. For gear… Current podcasting setup? How has your gear changed since you started? Started with the Focusrite 18i8… downsized to 2i2. What is something you think is overrated or underrated in podcasting? If someone was to only listen to one episode of yours, which one would you send? As a content creator, I feel like you’re only as good as your last episode you’ve released. Therefore, I’d recommend having a listen to my most recent conversation with Arlene Pellicane (episode 57) where we simplified how to better manage screen time with your kids. What’s working for you right now when you pitch yourself to be on other podcasts, to be THEIR special guest to interview?